Paul Ryan’s nasty ideal of self-reliance. MAL TIEMPO, BUENA CARA. Those words were attributed, in a wrenching story in The New York Times last winter, to Isabella Rivera, who is 86 years old and lives in Washington Heights. She exists on $688 a month in Social Security and $148 in Supplemental Security Income. When her apartment was destroyed in a fire, she had to continue paying her share of the maintenance fee during the long period of its repair, $153 a month, and another $150 a month for a room that some friends, also indigent, offered her in their home for the duration of her exile. Before the fire, Mrs. Rivera was attacked by a man with a knife. (“He twisted the knife inside my neck.”) After the fire, her son died of cancer. Another of her sons had died of a heart attack decades ago. And what Mrs. Rivera took away from her catastrophes was a kindly stoicism: mal tiempo, buena cara. In hard times, show a good face. But perhaps it is inaccurate to say that her response to her tribulations, her gentle perdurability, was what Mrs. Rivera took away from them. Perhaps her particular inner preparedness, her precise manner of resilience, was what she brought to them. The notion of suffering as transfiguration is religious propaganda. People generally suffer, and respond to suffering, as themselves, as who they are. It is rare that they are transformed by devastation and loss. They are instead intensified by it, italicized by it: they become more like themselves, because their prior resources, their psychology and (for those who have one) their philosophy, are what they have when misfortune strikes, and all that they have to see them through. The remarkable fact about survival is the continuity of the self that is revealed in adversity, not the discontinuity: indeed, the preservation of the self is one of the measures of survival. There are diverse methods for “coping,” and diverse interpretations that may be made of crisis and sorrow. In the aftermath of suffering, one’s understanding of the world may seem to have been altered or usurped by it, but that is a romantic mistake: most believers are not robbed of their belief, I mean their religious belief, by pain, even if some thinkers insist that their pain should count as a metaphysical (or anti-metaphysical) argument against it, and very few doubters have found God in the absence of pain, or in pleasure. This is as it should be: conviction is not the mere child of circumstance. One’s own experience is not all one needs to know for formulating a view of the world. Those who did not share our experience certainly cannot adopt it as a validation of our view. Even survivors can be solipsists. There are many ways to meet, and to think about, misfortune. It is understandable, perhaps, that the spectacle of human powerlessness—and there is no more shattering spectacle of it than the death of a loved one—would provoke, especially in a young person, a fantasy of power, but a fantasy of power is all that Randism is. “A being who does not hold his own life as the motive and goal of his actions, is acting on the motive and standard of death,” John Galt proclaims in his interminable credo at the end of Atlas Shrugged, a speech that Paul Ryan reads often (as he assured the Atlas Society in 2005) “to make sure that I can check my premises.” But the witness of mortality has been wasted on anybody who comes away from it with such a self-absorbed attitude about life and death. The loss of his parent hardened Ryan, as no doubt it has hardened other orphaned children; but in the aftermath of his loss he did not rely upon other people less, he relied on other people more. Anyway, his hardening is his problem, and must not be allowed to become our problem. I do not mean to deny Ryan his pathos, but it is he who comes to belittle the pathos of others. Ryan’s mind is inadequately aerated. His intellectual universe is a conformist, like-minded universe; he gives no indication of any familiarity with, or curiosity about, thoughts and traditions that differ from his own. I am not competent to evaluate his numbers, but no budgetary expertise is required to see that his moral and political concepts are crude and sometimes weird. The passage about “the safety net ... transform[ing] self-reliance into a vice” continues: “The Nation becomes a vast Potemkin Village in which the most important elements—its people—are depleted by a government that increasingly ‘takes care’ of them, and makes ever more of their decisions for them. They take more from society than they provide for themselves, which corrodes society itself, from the inside out. The environment also becomes ripe for exploitation and control by the few who remain ‘ambitious.’” Is Ryan one of the “ambitious”? It is hard to say. The meaning of that sentence, with its Galt-like ominousness, eludes me. It is pretty clear that Ryan does not know what a Potemkin Village is: the entitlements against which he rails are neither artificial nor ornamental. Ryan throws around “individualism” and “collectivism” as if they are utterly transparent and self-evident terms, and as if it is 1950. The poor guy was born too late for the intellectual excitements of the cold war, so he insists upon finding them in his own lifetime by apocalyptically transposing the old antinomies onto the contemporary debate about government and entitlement. Yet the analogy between the totalitarian collectivism of the Soviet Union and the role of government in Obamacare is talk-radio stupid. “With the demise of the Soviet Marxist experiment 20 years ago,” Ryan writes in his Roadmap, “the appeal has shifted to European-style socialism, with its redistribution of resources.” What on earth is he talking about? The redistribution of resources is a common activity of government, socialist or otherwise; and the Soviet Marxist experiment was not about the redistribution of resources. It was evil in a way that “European-style socialism” will never be. Is Dodd-Frank Lenin’s ghost? The staggeringly obvious fact is that we are not, in the United States in 2012, on a road to serfdom. Free enterprise in the United States is not remotely threatened. It is merely not universally taken to be the whole of American reality, or the paramount consideration in every American discussion of every American policy. We are living in an age of paranoid capitalism. WHAT, THEN, is so terrible about self-reliance? Nothing, unless it is promoted into an absolutism, into a cult of sacred egotism, into an “Invictus”-like illusion. (That is another classic of ego-swelling adolescent literature.) The more people do for themselves, the better. The more they assume responsibility for the course of their lives, the better. Who denies these noble banalities? Our agency is the clearest expression of our freedom. We possess extraordinary powers. It is miraculous what the works of human hands have accomplished, except that it is the opposite of miracle, because we are not supernatural beings. But Ryan’s concept of self-reliance, the gospel of John Galt (“you are your own highest value ... as man is a being of self-made wealth, so he is a being of self-made soul ...”), is devoid of all humility—it is the very vainglory against which the Bible, Ryan’s ultimate book, warned. My power and the might of mine hand hath gotten me this wealth! Ryan may have disavowed Rand’s atheism, but he has not quite escaped her revolt against human finitude, her deification of the individual. This radical individualism is a delusion of impotence made over into a delusion of omnipotence. It is also, analytically, a colossal mistake. The splendid isolation of the trader, the builder, the innovator, the entrepreneur, the superman, does not exist. It is one of the many flattering legends that successful people in this country devise about themselves. (Like the legend that success is a proof of personal virtue.) The individual—even the individualist individual—is always situated densely in the customs and the conventions of society. Where is Burke when you need him? And where are the otherwise ubiquitous metaphors of the network and the web? If, for conservatives, the market can serve as a model for society, surely it is because the market is web-like, society-wide, a social entity, a thicket of bonds and connections and influences in which creativity flourishes not least because it is enabled and implemented by others who, gratefully or opportunistically, recognize it. Competition is itself a kind of social compact, and in this sense a kind of cooperation. It is no wonder that Ryan, and of course Romney, set out immediately to distort the president’s “you didn’t build that speech” in Roanoke, because in complicating the causes of economic achievement, and in giving a more correct picture of the conditions of entrepreneurial activity, Obama punctured the radical individualist mythology, the wild self-worship, at the heart of the conservative idea of capitalism. An honest reading of the speech shows that Romney and Ryan and their apologists are simply lying about it. The businessman builds his business, but he does not build the bridge without which he could not build his business. That is all. Is it everything? Surely it takes nothing away from the businessman, who retains his reason for his pride in his business. But it is not capitalist pride that Romney and Ryan are defending, it is capitalist pridefulness. Ryan, too, is moved more by wealth than by need. “They take more from society than they provide for themselves”: Who? The jobless? The aged? The sick? The desperately poor? Of course they take more, financially. They do not do so recreationally, or because they are nefarious wastrels cunningly exploiting a gullible government. They would rather be employed and young and healthy and secure. But have they, in their infirmities and their disadvantages, no legitimate claim on our conscience that justifies a sacrifice of wealth to need? 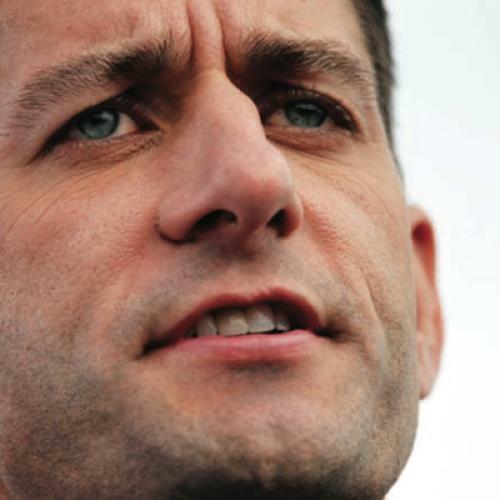 Ryan’s philosophy represents the demonization of need and the diabolization of weakness. To require assistance, to ask for assistance, to receive assistance: it is, in Ryan’s world of winners, a disgrace. The problem for Ryan’s steely vision, of course, is that many people do need help, and they are usually not responsible for the circumstances that have driven them to seek help. They suffer through no fault of their own. Sometimes they suffer through the fault of people who have more money and more power than they do. And even if they suffer through some fault of their own, are we to let them sink? We may have extraordinary powers, as the fit and fiscal Ryan believes we do, but none of us—not even in private equity—are gods. We are all vulnerable. We are never sufficient unto ourselves. Who is more self-reliant, indeed, than a poor man, or a man without a job? Truly he has only himself on whom to rely. But a rich man has so many things done for him, because he pays for them to be done. Is that self-reliance, or is it expensive helplessness? And why is it not a stain of shame, or a “culture of dependency,” for a rich man, or his bank, to ask for help, and to be given it? Like Emerson’s awkward confession that he sometimes gives the dollar, Ryan admits in his Roadmap that government “must also ensure a safety net, maintained by government if necessary, for those facing financial or other hardships,” and like Emerson’s dollar, Ryan’s safety net (no scare quotes this time) is an anomaly in his analysis. It is a pander, not a scruple. Ryan would rather continue to swoon over John Galt and exaggerate the impact of our will on our destiny. Confronted with the ineluctable role of contingency in human affairs, he prefers to respond with a hallucination of human control: with an AEI Prometheanism. His dogma of self-reliance is an utter misdescription of reality. He does not agree—this is a dissent not only from the religious traditions, but also from a good deal of secular moral theory—that the fact of our vulnerability is as primary for our conception of the moral life as the fact of our individuation, and that the natural and historical evils that visit us all—the egalitarian character of calamity—have any implications for our duties to others. Ryan regularly denounces the shirking of individual responsibility, but it is he who shirks one of the most basic responsibilities of the individual, which is the responsibility to others. Ryan is animated as much by a theory of government as by a theory of life; but his theory of government is erected in part on his theory of life. For government, limits; for the individual, no limits. A terrible fear of dependence has led him to a terrible exaggeration of independence. The self in Ryan’s self-reliance is a monster. I would not raise a child, let alone design a budget, on this stunted ideal. In a new book on child-rearing, I recently read this: “We tend to encourage self-reliance (a good trait), but resourcefulness is even better. Why? Because resourcefulness is the ability to both independently and optimally solve daily problems and to seek help from others when we can’t problem-solve independently.” It does not exactly sing, but it is exactly wise. We are not only a self-reliant nation, we are also a resourceful nation. But Paul Ryan’s plan for America would undo its magnificent inclination toward community, and leave us not only economically insolvent but also morally insolvent.